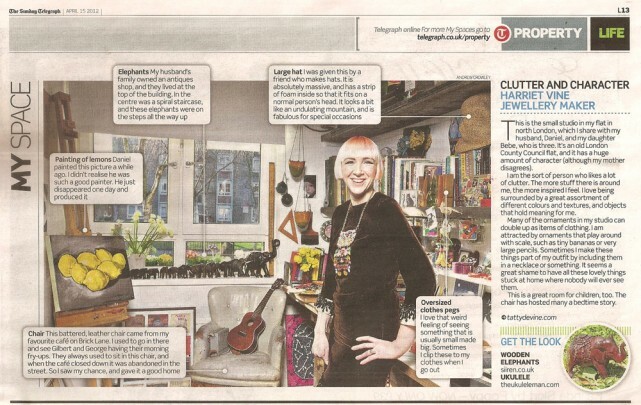 "Here I am in my studio room at home, in yesterday's Sunday Telegraph. I like to be surrounded by things that mean a lot to me, and there wasn't space in the Telegraph to talk about everything. I wanted to show you around a bit more, so here's the story behind some of the other objects in the room... I love Rob Ryan, and the starry night fireworks print under the worktop is one of his. There's a cassette tape made out of wool and cardboard to the right of my head, made by Rachael Matthews of Prick Your Finger, from a show she did in our Brick Lane store. The big hat is actually a Vivienne Westwood, given to me by Bernstock Speirs, which is a brilliant hat designers next door to us on Brick Lane. Leaning against the wall is a print of 'found' homemade record sleeves by Stephen Fowler and Rocky Alvarez. My ukelele is from the Duke of Uke - I've been learning for about three years now. The wallpaper brush hanging by the window is my grandfather's. He was a window dresser for the British Shoe Corporation and came up with the "back to school" marketing campaign. My mum was the first "back to school" girl in the adverts! The jardinières by the wallpaper brush belonged to my nan. I love big rulers, and one of my longest ones which is two metres long is attached to the edge of the top shelf. My velvet dress is vintage. It has lovely beaded cuffs. The beads fall off everywhere - every time I go anywhere in it, I leave a little puddle of black beads. And my necklace is, of course, Tatty Devine. It's the big gem owl from the last Autumn/Winter collection. There's nowhere better than a car boot sale for picking up things with character. I always check yourbooty.co.uk to locate my nearest car boot sale wherever I am. Find yours, and go rummaging for treasure. If you're creative, it's good to have your own home studio space, even if it's just a little desk in a corner. You need somewhere to stick stuff, otherwise you forget about it. Keep inspiration all around you."